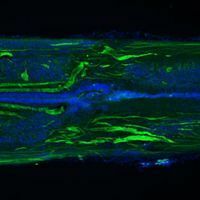 WIKIMEDIA, METHOXY ROXYNeural regeneration has long been eyed as a possible treatment for spinal cord injury. 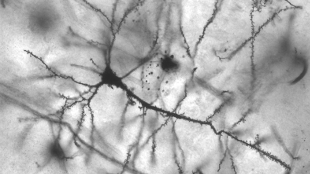 Unfortunately, most studies have shown that unless new cells are grafted within a few weeks of injury, no new neurons are able to grow. This is in part because astrocytes and other neural support cells form a scar, of sorts, that physically blocks neuronal growth. 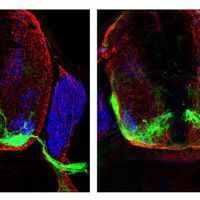 But Ken Kadoya and colleagues at the University of California, San Diego, have demonstrated that neurons can and do grow in injured rat spinal cords months after injury, according to research presented at the Society for Neuroscience (SfN) meeting being held in Washington, DC, this week. 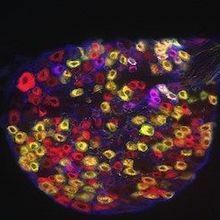 The researchers grafted neural progenitor cells from fetal rats into lesions in the adult rat spinal cords either two weeks or six months after injury. In both groups, the results looked nearly identical: the lesions filled up with new neurons, and those neurons projected axons to the brain stem and to distant regions of the spinal cord. 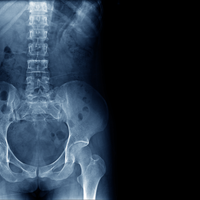 “Even if you graft six months after injury, you can get many neurons in the lesion site and those neurons can connect to the host neurons,” Kadoya told The Scientist.